A huge number of the properties at Universal Orlando – including Jurassic World, Despicable Me, Fast & Furious, E.T., and, of course, Harry Potter – all join forces to celebrate the end of your epic day at the park. This nighttime spectacular utilizes 40-foot-wide water curtains (as movie screens), 120 water fountains, fireworks, and, even, state-of-the-art projection-mapping on the buildings surrounding the lagoon in order to wrap you fully in the extravaganza. Cinematic Celebration is, at least as of right now, only performed once a night. It’s also important to note that it may not run every single night of the year – you should double-check with a team member once you’re on site that day. Its viewing area in Central Park, which can hold up to 6,500 guests, consists of three different tiers and a grassy area that is located above and behind them, with standing room only available throughout. The best spot in the house is the third level – the one farthest away from the water – directly across from and slightly to the right of the Starbucks that’s on the other side of the lagoon. This vantage point, we’ve found, allows you to take more of the vista in, and it also prevents you from getting (as) wet from the water fountains’ various sprays. Make sure to arrive at least 30 to 45 minutes before showtime for a good “seat” of any kind. Just like with Cinematic Celebration’s predecessor, which had a dessert add-on available for an upcharge, Universal also had an exclusive, limited-time, holiday-themed viewing area and dessert party available for its newest nighttime spectacular. While this experience, which included sparkling wine and cider and an assortment of seasonal desserts, was only available from December 24 through December 30, 2018, we’re still making mention of it here – one never knows when the company will trot it back out for another limited engagement. You can read all about the dessert party in our Holidays guide. The two-minute Harry Potter sequence opens with various spells being cast, with the audience able to see the magical results playing out all around them. 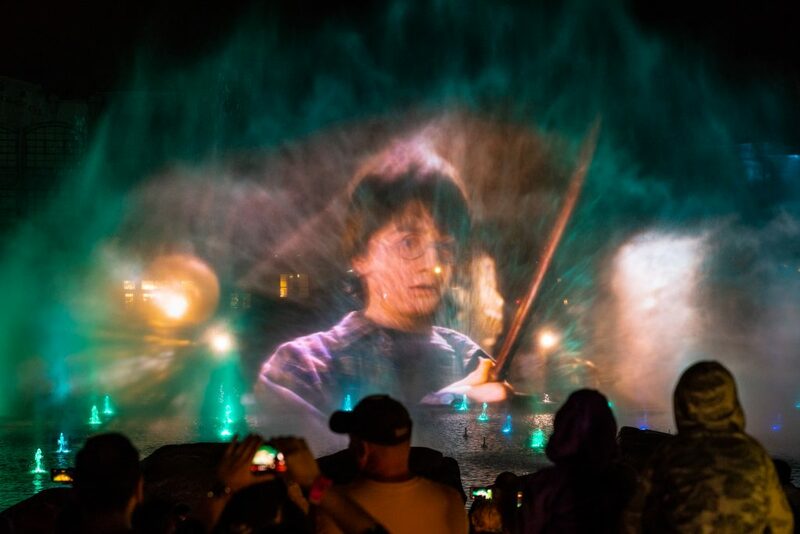 Universal has said this was done deliberately because it wanted to honor the one way that guests can be directly connected to the brand while in The Wizarding World of Harry Potter: purchasing a wand and engaging in interactive spell-work. You can find a more complete breakdown of Cinematic Celebration’s overall contents here (we didn’t want to put spoilers up for everyone to see here on our guide page) and a specific emphasis on its Wizarding World segment, including its triumphant climax, here. Additionally, we have a brief-but-thorough rundown of the first three lagoon shows at Universal Studios Florida here, and a full-blown look at the previous production, Universal’s Cinematic Spectacular: 100 Years of Movie Memories, here.